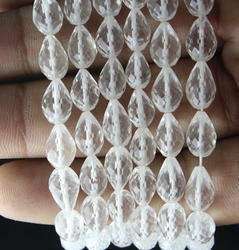 We bring to you a complete spectrum of translucent and iridescent faceted laser cut crystal coated beads. They are ideal to create eye-catchy jewelry items. Made out of very high quality materials and treated with laser cut finishes, each piece allows the reflection of light that gives them a wonderful sparkle and iridescence. Give a glam makeover to those gorgeous tresses with the right dose of sparkle and style. Grab our stunning styles of hairbands, hairclips, and clutchers. Valentine Special Gifts For Special One.. Hair clip Size - 7.2 cm long and 3.4 cm width. We are offering Faceted Crystal Caps for Doublets and Tripplets. This product is produced in various sizes and shapes. Black Crystal Glass Beads If you need Bulk Purchase pls contact us for Bulk Prices and quanity.